Bear Fever has given me a chance to reach out to the community and encounter people I would have never had the chance to meet. This past week I met with two of the five or six artists involved with the Boyertown Elementary School bear: Katie DiStefano and Paula Stackonis. They kindly answered all my questions and allowed me to take many pictures of their bear. 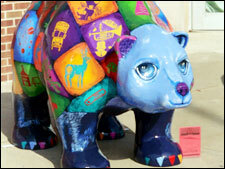 Upon entering Boyertown Elementary School (BES), I saw a beautiful, colorful bear that resembled a patchwork quilt. It literally took my breath away. Each patch held a different picture with a different story behind it. The phrase “a picture is worth a thousand words” rang true in this case. 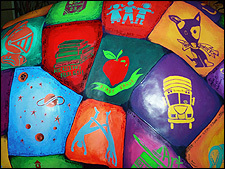 One of the artists—Paula Stackonis—involved herself in this project to get engaged in the community and because her children attend BES. She attended Kutztown University and was the the designer and Art Director for the National Association of Colleges and Employers in Bethlehem, PA. She is now a pet portrait artist because it allows her to continue to paint and work at home where she can be with her children. 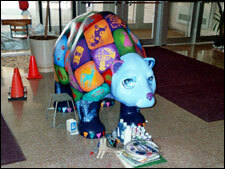 During this project, she highly enjoyed talking with the kids when they inquired about the bear. Katie DiStefano, another artist, is the art teacher at BES, and she decided to become a part of this project also to be able to get involved in the community. 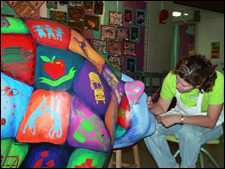 She commented that it would be weird not working on the bear since it had become such a regular part of her day. Besides teaching art, Katie also helps to make sets and designs costumes for youth musicals. When I asked if she ever had time to paint her own art, she replied that in her spare time she creates charcoal pictures and oil paintings as gifts for family and friends. 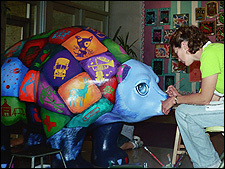 But her real art is working with children and creating little projects for them to do so they may come to appreciate art fully and to realize its influence on other generations. 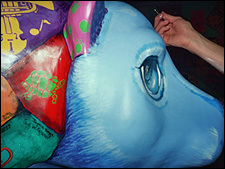 Coming up with a theme for their bear was a challenge for the artists. 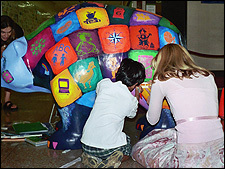 They wanted to do something that would encompass the entire school, so they decided on a patchwork quilt bear with each patch symbolizing each part of the school. 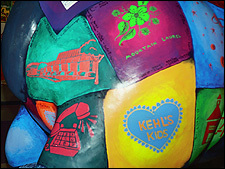 The artists then asked each teacher to submit a “patch” that he or she felt would best represent their class. Each teacher tackled the task differently. Some teachers decided what the class’s patch would be; other teachers picked a few ideas and had their students vote; while other teachers allowed students to submit their own drawn picture. One class picked a picture of a world with children holding hands around the world because the class was composed of children of many nationalities. The kindergarten class decided that they wanted a picture of a bear for their patch. This particular bear represents the one that they crowd around when it is story time. The “specials” teachers (teachers of art, music, physical education, etc. ), the secretaries, and the custodians were also asked to submit either an idea or picture of what they felt best represented them. The secretaries settled on a phone that never stops ringing and the custodians wanted a picture of the whole school because that’s what they take care of. 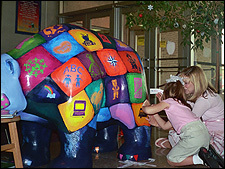 After each patch was painstakingly painted on the bear, each student was asked to sign the bear on the outline of their class’s patch. Their signatures and/or initials were to symbolize the stitches of a patchwork quilt because it was felt by the artists that it is the children who bring the school together. Not only was I given the opportunity to meet these two great artists through this project, I was also able to speak with Mrs. Jill Dennin, PTO president. BES’s PTO sponsored the bear. 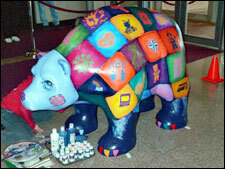 Mrs. Dennin has been part of the Bear Fever team since the very beginning of the project. At that time (August 2003), she was head of another team that had to decide what to do with some grant money Dr. Bakken, Pupil Service Director, had secured for the school district in order to promote students working together with the community. Because Bear Fever’s mission includes student involvement with adults in the community, the team decided to use some of the money to purchase the first two Bear Fever bear forms. And, of course, Mrs. Dennin was eager for BES to have its own bear. Thus, “Patches” was born. Mrs. Dennin is very happy that she involved herself in this community project because she got to meet a lot of business people and high school students in Boyertown that she would never have met otherwise.